Tandem equipment proudly represents Daubert Cromwell and stocks it's VCI (Volatile Corrosion Inhibitors) product line. When metals are wrapped or packaged in VCI, the chemistry volatilizes in the packaging environment and forms a protective molecular layer on the surface of the metal. This protective layer prevents the oxidation and corrosion of metal surfaces. 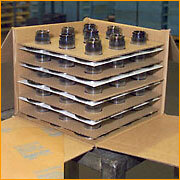 Simply store or ship metal parts in VCI packaging. When the parts are unwrapped, the protective layer immediately begins to dissipate. The metal parts are clean, corrosion free, and ready to use. No washing, dipping, or cleaning is necessary and absolutely safe. Daubert Cromwell papers come in a variety of grades. Larger or irregular shaped products should be protected with heavier grades of paper, while smaller parts can use lighter basis weights. Several Daubert Cromwell products feature special substrates that combine corrosion protection with barrier packaging. Barrier coated papers and films protect against moisture and grease; laminated grades afford heavy duty protection against adverse environmental conditions. Daubert Cromwell papers are available in standard 36" or 48" rolls, and widths up to 120". Papers can be converted into bags, envelopes, wrappers for individual parts, shrouds for large pieces or stacks of parts, covers and liners for container storage. Daubert Cromwell has several weights of kraft, plain or barrier coated papers to protect against moisture and grease. Laminated grades are available with polyethylene for heavy duty protection against the environment as well. Daubert Cromwell can custom-print paper with your logo for easy brand identification to your customers. Your logo, instructions or message appears in crisp, clear detail. Polyethylene film has its own unique properties as a packaging material. Can be applied automatically and removed quickly. 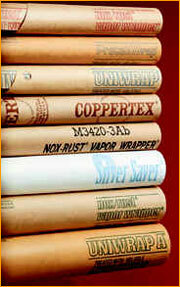 VCI film products provide proven corrosion protection. Through volatilization and contact, the nitrite-free VCI chemicals protect metal parts against the corrosive effects of moisture, salt and other contaminants while they are in process, storage or transit. How does VCI film work? The corrosion inhibitors are extruded right into the polyethylene film, not superficially applied. As a result, the volatile and contact inhibitors provide long-term corrosion protection for the most intricate and hard-to-reach surfaces. The corrosion protection is clean, non-discernible, without odor. VCI film is transparent for easy inspection and identification of parts. It will not affect the performance of the protected metal, and the parts are ready to use immediately after removal from the packaging without additional cleaning. Other custom shapes & sizes. VCI devices add an important dimension to corrosion preventive packaging. Devices that give off, or emit, VCI compounds protect recessed areas within a package. These devices can be inserted in hard to reach areas. Often, they are used simply to enhance protection by giving a 'boost' of available VCI. 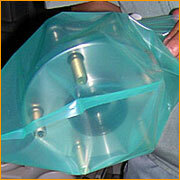 In some cases, a VCI pouch or chip can be added to a plain poly bag to provide VCI protection where none existed before. Which Metals are in need of protection. Corrosion inhibiting chemicals used and their effectiveness on the metals. Ratio of chemicals in the formulation. Amount of VCI on the paper or in the film. pH of the finished product. Water solubility and the effectiveness of the corrosion inhibitor in the presence of moisture and/or high humidity. Natural neutral kraft paper or polyethylene film used as the carrier for the VCI. The overall packaging design and the conditions expected during packing, shipping and storing. Not all VCI's are created equal and often, one VCI formulation that works under one set of conditions will not work under another. One has to take into account all aspects of the process, metals composition, packaging, storage and shipping conditions in order to select the right packaging media and VCI formulation. A large number of combinations are available from Daubert Cromwell and chances are we have one that will be effective in any specific application. To learn more about packaging your products with Daubert Cromwell®, please view our Packaging Design Criteria file. You will need Adobe Acrobat to view this file. You can download a copy for free by clicking here.